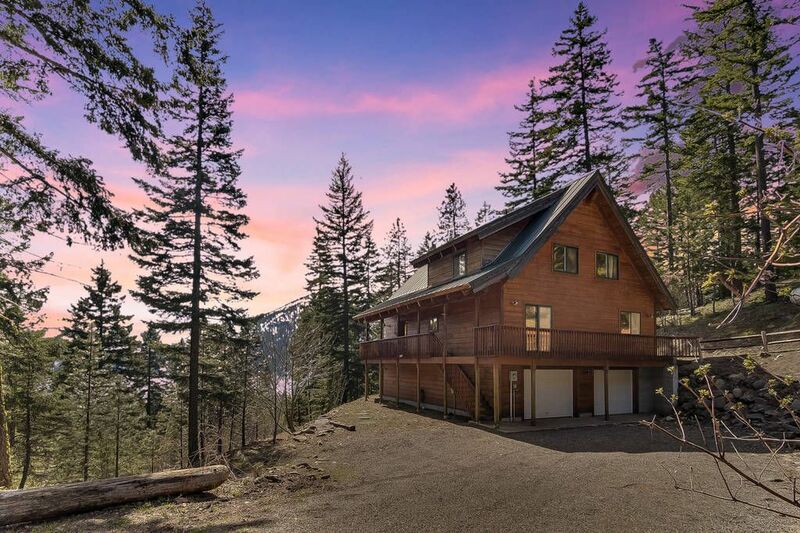 Ridgecrest Hideaway is a stunning 3,100 sqft custom built lodge style home with sweeping views of Lake Cle Elum. Nestled among tall evergreens, this private mountain retreat features a massive great room with floor to ceiling stone fireplace, expansive deck with mountain and lake views and plenty of room for everyone. * Amazing Mountain & Lake Views! Bedrooms: Two bedrooms with queen beds and a full bathroom are located on the main floor of the home, adjacent to the kitchen and great room living area. Two more bedrooms, each with a queen bed, and another full bathroom are located upstairs. Downstairs the game room has a twin over full bunk bed. Tiger Lilly Lodge is a fantastic home for respectful family gatherings and mature couples over the ages of 28. All guests will be required to sign a rental agreement after the reservation is accepted. This home is protected with external security cameras. We had a wonderful time at Ridgecrest Cabin. Well equipped kitchen. Clean sheets and lots of extra towels. The only thing we weren’t so happy about is the temperature at night gets super cold and the thermostat is blocked. Besides that we had a great time. The cabin is stunning! It has everything you need there waiting for you. Blankets, towels (plenty), kitchen stocked with crock pot, blender, just everything you could need. I have read reviews about the fireplace not working downstairs so we were not upset but the heater they had was great. It was not cold for the youngins at all. We stayed in March and there was still snow. The view is amazing. They made it so simple to check in and out. Great service. Fantastic time for our party of 7. Everything was clean and well decorated, the kitchen had what we needed to cook full meals. The hot tub was inviting and obviously kept meticulously, very important for hot tubs. The beds were very comfortable, I slept great. The home was bigger than in the photos in my opinion. Also very private, at the end of a wooded road, with stunning views of Lake Cle Elum. I would not hesitate to come back! Plenty large for 3 families with 1-2 kids each. Beautiful views of the lake. Our main issue were the yellow jackets. Even in single digit temps, they were everywhere which was an issue with toddlers running around. There's a nest somewhere that needs to be address and then this place is perfect. The only other consideration during the winter is the driveway can be a sheet of ice. Even my 4x4 truck had to park outside the driveway. Pros: the cabin itself is built nicely. Hot tub is top notch. Close to the lake. Even though it’s not on the lake, it has a nice view of it. Has a wood burning fire place. Perfect place for people with older kids since there is a basement with bunk beds and a tv. Cons: the cabin is not cleaned properly. There was several spider webs. The windows had a lot of dead and live flies. The furniture and bedding was all poor quality. After stripping our sheets, we noticed that the mattress pad was taped with duck tape at some spots. Seems like they left the bare minimum for their guests. We had only 5 dishwasher pods. Which is not enough if you are having breakfast and dinner. Also, there was 3 tide pods for the washer. Not enough. Another issue we had is the hot tub is at the bottom level under the balcony. The snow was melting and dripping into the hot tub. We had to clean out the whole balcony before using it. The water pressure in the shower was almost to none. The downstairs is very cold. Had to use several blankets at night and was still cold. Also, no one replied with the questions I had when I messaged through homeaway to the property manager. Also, the cleaning lady arrived at 10:45. Check out is not until 11, so we didn’t appreciate being rushed. This cabin has the potential to be amazing. But because of the poor quality of things and the uncleanliness, we will not be returning here. Great cabin for a family getaway - everyone had a wonderful time! The cabin was very well appointed and there was plenty of room for everyone, even the dogs! ** Our Online Promotions are automatically applied to the dates you enter, therefore the Avg Nightly Rate listed above will adjust.